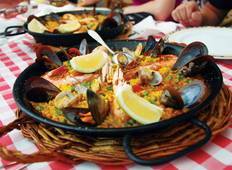 Find a Food & Culinary trip that explores Europe. There are 187 tours to choose from, that range in length from 3 days up to 25 days. The most popular month for these tours is September, which has the most tour departures. 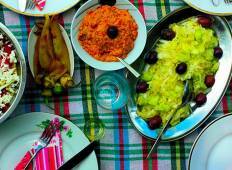 "7 days Tapas Trail- Geidre is an amazing tour guide. She was extremely knowledgeable,..."
"My first experience with tourradar and soleto tours - the tour was amazing! I would..."
"Sicily was great, the transportation was very good, fellow passengers were a great..."
"I recommend adventure with Marino, we were sightseeing, admiring architecture of..."
"Great trip of 3 ladies. Loved taormina. And siracusa. Palermo was just ok... too..."
"What a great trip! Just WOW. Excellent hotel location, great choice of activities..."
"Both Etna food and wine and Taormina food tour were excellent. Booking was easy Massimo..."
"This tour was just plain INCREDIBLE! It was our first time going abroad so we took..."
"This was an exceptional tour with quite a difference! I am a 59 year old female from..."